First up, some exciting news! I'm always open and honest with my partnerships here on the blog. Just as I have previously, I wanted to share a little about my latest sponsorship with you. In perfect timing, as #noBuyJuly15 is now over....I'm going to be partnering with Shopbop! Shopbop is definitely one of my go-to-sites when I'm looking to buy something (as you'll know if you subscribe on youtube), so I'm really pleased! In Australia, it's tricky and expensive to find a lot of my favourite designer accessories like Marc by Marc Jacobs and Rebecca Minkoff. While they are getting easier to find here, I can't get past checking Shopbop first. They always have the best range, and the 3 day international shipping is often faster than regular shipping within Australia. So what does this new partnership mean for my blog? I'll still be sharing what I wear, you might just see a few more links sprinkled here and there to Shopbop, and I'll start to call out when I'm wearing things that I bought from there so you can head over and check it out yourself! As always, I'm open to comments, feedback and constructive criticism so if you have any suggestions for improvement let me know. The content on this blog will always be written by me, that will never change, and you are under no obligation to click anything to support the blog. Now, the outfits. More denim outfits, and again with this Jeanswest jacket. I went for a little while not wearing it and now it's back in heavy rotation. Winter weather makes me reach for jeans and leather jackets frequently. Add a bright scarf and you have a simple, easy winter stay at home mum outfit. This is the second tartan scarf my sister brought me back from Europe. Thought it would look good with the grey top, and was a lovely way to add some colour. I actually took my jacket off during the day as it warmed up as we wear outside in the sun..
We went out with my sister to take baby T to a farm down the coast we had visited often when we were younger. It has delicious food, and also a petting zoo so he got the chance to pat and feed some of the animals. It was adorable seeing his little face light up! It's been over a year since I last wore this top. I wore to give it one last wear, but I've decided to hold onto it. It's a great neutral so it's staying. Last worn: Jeanswest leather jacket, grey knit, Jeanswest prima denim skinny jeans, black ankle boots, Louis Vuitton speedy bandouliere. First time I've worn the scarf. Other ways to wear: leather jacket and printed dress, grey knit for travel, kimono and skinny jeans, ankle boots and a shift dress, speedy bandouliere with a printed dress. 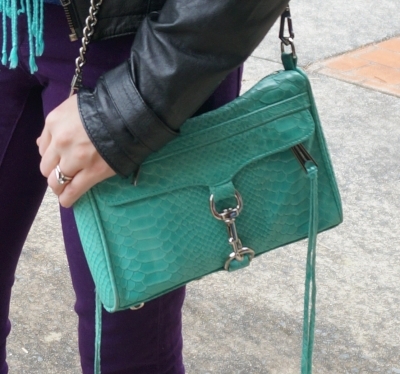 Told you I'd wear this scarf and bag together again, they are too perfect! Didn't realise I'd be wearing them together with the same jeans though, ha! I like the aqua with the purple, and I thought that the blue knit was another nice colour to throw into the mix. After a tiring night (as you can no doubt tell by the photo!) we had a more relaxed day, checking out some of the toy sales around as baby T had some birthday money to spend. Other ways to wear: leather jacket with black and white outfit, pashmina with a printed dress, blue jumper and black maxi skirt, purple skinny jeans in spring, Converse in summer, mini MAC with a maxi dress. Linking up with Flashback Fashion, Passion for Fashion, Friday Favourites, Casual Friday, Favourite Fashion Friday, Fashion Friday, Fab Favourites, The Ultimate Rabbit Hole, Shoe and Tell, Hello Monday, Pieces of Me today. Love, love your Jeanswest leather jacket, Mica! The first look with the gifted tartan scarf is my fave, can't wait to wear a similar look in fall. Agree with you, aqua and purple are a lovely color combination. Have a wonderful Friday, Mica! Congrats on collaboration, dear. You look stunning in these pictures, love your red scarf. Congrats on your new partnership! I am especially loving your first look. I cannot wait for fall so I can break out my plaid again. 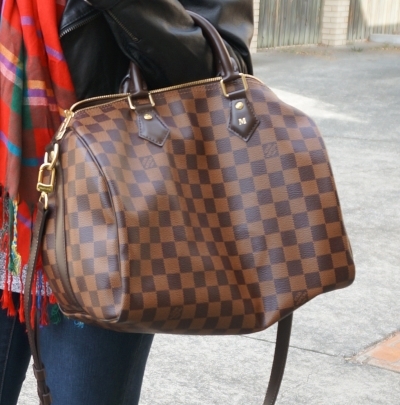 Your scarf looks good with your LV bag. One of my favourite stores too, they have too many pretty things...haha! I wear my scarves a lot in winter, I try maximise the wear-time as I know I can't wear them over summer! nooooo it's too soon for fall clothes! haha, i just got over a brutal boston winter so i'm reluctant for the next season but you look lovely! haha we are in the middle of a brutal winter here in Australia! It's so COLD! Aqua and purple do go together quite well! Who would have thought?! Looks like something I'll be trying in the very near future. I hope you can try the aqua and purple colour combination! I'm sure I stole it from another blogger but I can't think who! It's always fun to start partnerships with brands you love! I love that red scarf, too. Thanks for the introduction to Shopbop can't wait to check them out! Cute looks! A pair of skinnies, a leather jacket, and a scarf are such a classic combo! That is exciting news! Congratulations on the collaboration! I’ve always loved your blog but never knew you had a Youtube channel. I just went over there to check it out your voice is so cute! Will have to start watching your videos now for reviews on stuff. Love the outfit here, you wear a leather jacket well! Thanks! My youtube channel is a bit neglected, I need to get better with uploading videos on it! Love the jacket! Jeans + leather jacket has been a staple outfit of mine during the winter too. And yes, it's so hard to find designer stuff in Australia - Adelaide in particular. Congrats on your partnership! It's hard in Brisbane too, not a lot of choices here! :( Thank goodness for places like shopbop, haha! Two very pretty looks once again, definitely loving the leather jacket a ton! Love your scarves so much, especially the first one, Mica! And your violrt jeans are really cute! Loving your jacket! I've been on the hunt for the perfect leather jacket for years but yet to find one. And I'm super fussy! That Rebecca minkoff bag hue is just divine. Congrats on your new partnership - that's great news! I love your jacket! I got a faux leather jacket from Primark when I was in the UK. It was cheap as chips and I love it to bits, I don't know how my wardrobe has survived so long without a leather jacket in it! When our winter comes around I'll have another colour combo look to wear courtesy of your second outfit as I too have a pair of purple jeans! The aqua looks fab with the purple and a great idea to add another blue tone in the mix with the cobalt blue knit. I really like your outfit! You have great style! I love leather jackets, they really play up a look! Both looks are so on point for this leather jacket! I love that first outfit! I have a scarf like that as well (though I rarely get to wear it in California), and I'll definitely be copying that outfit this winter. I don't think there's anything in my wardrobe that I have gone a year without wearing. My collection is so small and minimal. I often feel like I wear the same things over and over. I feel like I wear the same things over and over, but it's not for lack of choice, haha. I certainly want to slim down my wardrobe to something more manageable, like yours! First outfit is my favorite, I love that scarf. YAY! How exciting! Congrats on your collabo - that's such fab news. You must have been thrilled! I wish I could pull off a [faux] leather/biker style jacket. They seem to be so effortlessly chic for everyone else but I haven't found one that suits me yet. I love leather jackets! Definitely a must have for cooler weather. And I love the Rebecca Minkoff purse! Thanks for linking up! I love the first look with the checked pattern!! The second outfit is my favorite! I love how you combined the bag! Love your style, youre so beautiful! I can't wait to break out the booties again! I love both of these outfits! Congratulations on your collab with ShopBop. That sounds so exciting! Super congratulations on the ShopBop collaboration Mica! That is so awesome and well deserved! I can't wait to see what you style. Love both outfits! That scarf in the first outfit pic is so gorgeous! Again, you have the best scarf collection. Although it tends to be a little beyond my budget, I do love perusing Shopbop, so it's great to hear about your partnership! I love both of these looks--your plaid scarf is great and I love the bold color combo in your second look! That first look is so something I would wear! Congrats on the new partnership! Love both your scarves - especially the tartan one. They sure finish off your outfits so nicely. I love your scarfs, those colors are beautiful! You look great! I love how you're matching your scarfs. So cute! Congrats on the sponsorship! That's so awesome!! I am in love with your scarf collection. Can you please send me that red plaid number once winter is over? K, thanks!